I believe strongly that open source and open internet standards are doing the same to traditional software. And value is migrating to a new kind of layer, which we now call Web 2.0, which consists of applications driven not just by software but by network-effects databases driven by explicit or implicit user contribution. So when Larry Ellison says that cloud computing and open source won’t produce many hugely profitable companies, he’s right, but only if you look at the pure software layer. This is a lot like saying that the PC wouldn’t produce many hugely profitable companies, and looking only at hardware vendors! First Microsoft, and now Google give the lie to Ellison’s analysis. The big winners are those who best grasp the rules of the new platform. Two things stuck with me in the post. 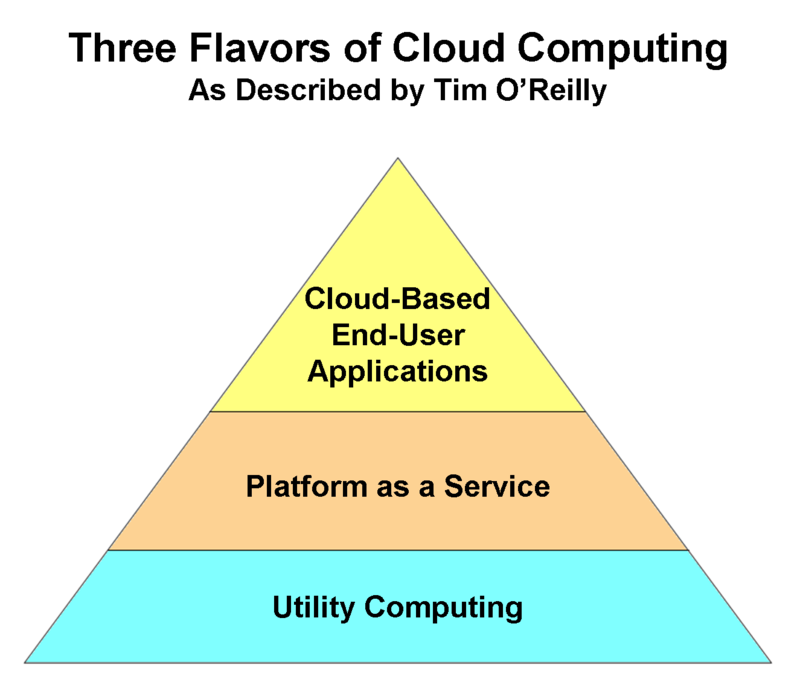 First, Tim does a great job delineating the different types of cloud computing. I put them together in a graph, rising in order of specialization and (generally) value-add. Cloud-Based End-User Applications: web services are cloud-based, but people make a distinction between Google Search, and Google Docs. Same server farms, same cloud-based delivery. The difference is that Search doesn’t hold personal information, Docs does. So the holding of personal or company information is an important distinction here. It’s that third, top level where Tim makes an interesting point. Larry Ellison holds that cloud computing is an interesting approach to delivering software, but not one that returns a lot of value to vendors. Tim argues that Ellison is right about the Utility Computing layer, but that he’s missing the bigger story with the Cloud-Based End-User Applications. I’m not so sure Ellison is wrong. The principle of Web 2.0 is powerful: “the user’s data becomes more valuable because it is in the same space as other users’ data.”It’s powerful, and continues to be a sea-change in thinking for Web applications (the idea itself isn’t new – it’s the whole premise of any market). If Oracle isn’t playing that game, they will one day be doomed to irrelevance. Perhaps, like hardware giants of the past – Compaq, say – they will be absorbed by a bigger company. Or perhaps, like Unisys, they will linger on in specialized markets, too big to go away but no longer on the cutting edge of anything. Or they will understand that it’s not the database software that matters, but the data that it holds, and the services that can be built against that data. Oracle sells its software to big enterprises. The information in Oracle’s databases is a core strategic asset and basis of operations for companies. You don’t get to mess with that. At least not lightly. Putting the database software in-the-cloud and enabling external network effects to occur against that data will be a hard sell for any vendor. I can think of two reasons off the top of my head. Third party access to data: First, it requires that external parties have some level of access to a company’s data. Right there, the typical response from the CIO will be…why? Why would I let someone anywhere near my data? There is no way you’ll convince a company that parking its data in a cloud will increase its value because other companies’ data is also there. There is an ecosystem argument that if many companies do park their data ijn the cloud, they’ll get the benefit of better third party apps who can leverage that cross-company data to deliver better applications. Which brings me to a second thought. Ecosystem already exists: For a large installed base of software, like Oracle, a robust ecosystem already exists. Companies recieve plenty of pitches from vendors for add-ons to their Oracle, Microsoft, SAP, etc. software. Strictly speaking, having to go from company to company, looking at the installed software, does not address the “live web” potential of network effect advantage. I mean, you’re privy to usage stats and data content during the install, then you have no visibility as a third party software vendor. But the experience of going company to company provides some knowledge to these ecosystem players, and the next dot release will incorporate some of the learnings. I don’t enterprises are suffering from a lack of new ideas with regard to their installed software. In the enterprise world, it’s so very dog-eat-dog. And here’s the problem with network effects, especially for large companies: Large companies see much more of what’s happening in the market than do smaller competitors. Their installed proprietary databases are gold. If they put that in a database cloud, who really benefits? Smaller competitors who also participate in that cloud, and an ecosystem of software vendors. But the enterprises don’t gain nearly as much as the smaller players. Which from their perspective, actually makes the enterprise worse off. I think Tim is onto something for the consumer and the small business markets. Cloud computing will give them access to information and an ecosystem that they currently do not enjoy. We see this all the time with Web 2.0 sites – eBay, Google Search, Facebook, etc. But in the enterprise market, I’ll disagree with Tim, and his view on the faultiness of Oracle’s current position. Oracle’s dominant market position and corporations’ own motivations, proprietary knowledge and data sensitivities diminish the value of network effects for the enterprise market.